Nok Airlines employees in yellow Santa Claus suits parade through the new terminal at Don Muang airport Thursday. Don Mueang (originally spelled Don Muang) International Airport (IATA code DMK) is the not so little airport that won't die. It started functioning as an airfield in 1914, before commercial air service was a thing, and has grown through the years. For a while, it was one of the busiest airports in the world but Bangkok has outgrown Don Mueang. When it was established, Don Mueang was in the middle of rice fields and farms north of Bangkok. Now it's in the middle of the suburbs and industrial parks. 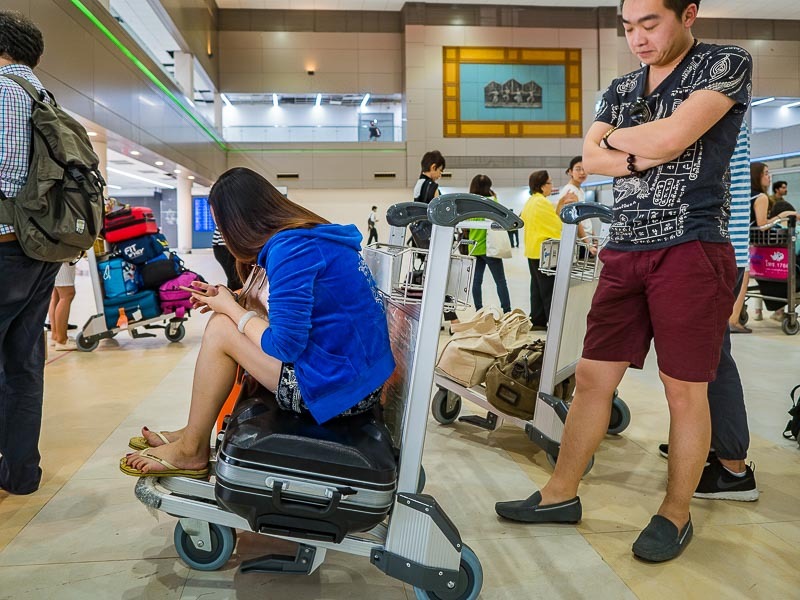 There's no room left for Don Mueang to grow. Some of the lines to check in at the Air Asia counter in the new domestic terminal at DMK. In the early 2000s, the Thai government built a new airport east of Bangkok. Suvarnabhumi Airport opened to much fanfare in September 2006. 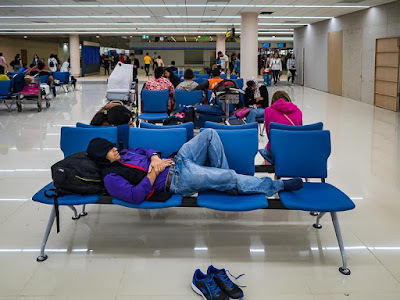 Don Mueang slid into backup status (it's also an important base for the Royal Thai Air Force), a few low cost carriers and private planes continued to use the airport but its days seemed to be numbered. But things don't always work out the way they're intended and Don Mueang never completely closed. As the Thai and Asia economies expanded so did air travel in the region. Tourism boomed in neighboring Cambodia and Myanmar and Bangkok was the gateway for both places. Suvarnabhumi was soon exceeding capacity. Airports of Thailand (AOT), the body the owns the two Bangkok airports, looked around and said, "hey, let's paint and reopen Don Mueang and move the budget carriers to the old airport." And that's what they did. 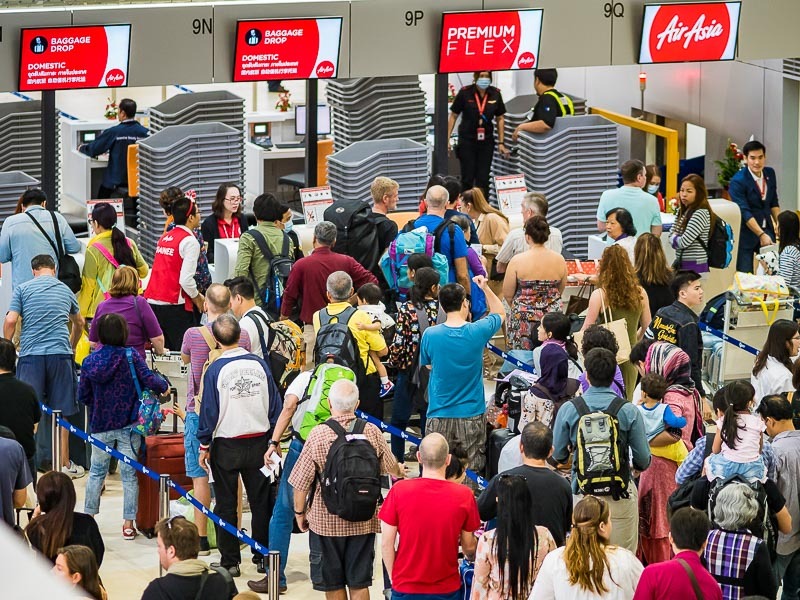 They told the budget carriers, like Air Asia, that they had to use the old airport and reopened it to great fanfare in 2012. Passengers wait to check in in the new terminal at DMK this morning. Less than two years later, Suvarnabhumi is still over capacity and now Don Mueang is also over capacity. When the old airport reopened it was sort of rushed job to relieve pressure at Suvarnabhumi. The old DMK barely got a new paint job and was kind of dingy with minimal services. (Try finding a plug at the departure gates. Go ahead, I dare you.) 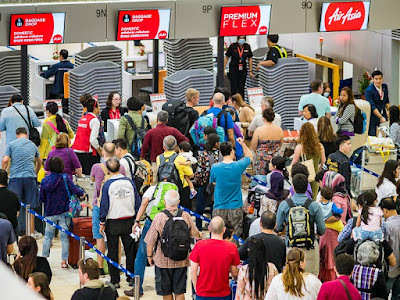 It was generally faster to fly in and out of Don Mueang because lines were a little shorter but the experience in the airport wasn't as nice. But that changed when the new domestic terminal opened today. They completely refurbished one of the existing terminals at DMK, giving it a lot more than just a paint job. It's as new and shiny as any airport in Asia with amenities to match (excepting Changi in Singapore, which is one of the nicest airports in the world). Next on Airports of Thailand agenda is to refurbish the international terminal at Don Mueang, which is still in the old, comparatively, dingy part of the airport. A man sleeps in the new, not completely finished, terminal. There are more photos of crowds in the new terminal in my archive or available from ZUMA Press.